Doxycycline antibiotics can get your kitty better if she has an upper respiratory infection. If your vet diagnoses your kitty with a bacterial upper respiratory infection, an antibiotic is an important part of treatment. Doxycycline is a broad-spectrum antibiotic in the tetracycline class that's sometimes prescribed for this purpose in cats. It kills off the bacteria causing the problem, reducing symptoms along the way. Antibiotics are the main course of treatment for a bacterial infection, including those affecting the upper respiratory tract. Your vet prescribes doxycycline if he believes your pet's infection is caused by a susceptible bacteria. Your kitty's symptoms are probably mostly in her nose and throat. They'll gradually improve as the bacteria is eliminated. It's important to administer the full course of your prescription, even if your cat's symptoms appear to be gone; they can clear up before all the bacteria is killed off. Your vet may also suggest another medicine to ease your kitty's symptoms while the doxycycline goes to work on the underlying cause. Home care consists mostly of wiping away discharge, providing plenty of water and offering lots of affection when your cat comes around looking for it. A typical doxycycline dose for treating bacterial feline upper respiratory problems is 2 mg per pound of body weight given twice per day. While this is fairly standard, always stick to the specifications of your prescription, even if they vary from this. Doxycycline is usually given as an oral tablet or capsule. 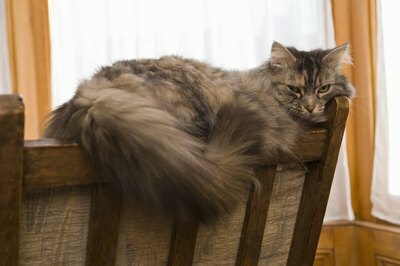 To limit or prevent gastrointestinal side effects, give the medicine to your kitty on a full tummy, after a meal. As with most antibiotics, diarrhea, nausea, vomiting and other gastrointestinal upset are the most common side effects of doxycycline. Trouble swallowing and rashes may also result. Serious adverse effects of doxycycline that call for immediate veterinary attention include fever, severe headaches, lethargy, dizziness, lesions, hair loss, vesicles, little or dark urine, jaundice, confusion and weakness. The tablet form of this medication is known to get stuck in cats' throats, too, potentially causing esophageal damage. Provide your kitty with plenty of fresh water after administration. Doxycycline can interact with lots of other drugs and supplements, including antacids, anti-clotting medications, barbiturates and insulin. Make sure your vet knows everything your kitty takes when he prescribes doxycycline. Take extra caution when giving this antibiotic to young kittens, pregnant or lactating cats or those with liver or kidney failure. Allergic reactions to doxycycline are possible. Don't give it to your pet if she's had a hypersensitive reaction to another antibiotic in the tetracycline family before. If your kitty develops a rash, itching, hives, facial swelling or difficulty breathing, take her to your vet or to an emergency veterinary hospital right away.